The older I get, the smarter I should get. I’m working on it (getting smarter), but sometimes when you are in the heat of the moment, the little things that matter can be quickly forgotten. As was the case with the buck that I stopped (with a mouth grunt) that was chasing a doe and a spike. This all happened the Thursday before the MN rifle season opener. I heard them coming, so I was “ready”, but when he came through the opening and I stopped him, I forgot to bare down low. And as I shot, he jumped the string and my arrow and broad head passed right through the upper portion of the animal. He did not bolt, and I was not sure if I had clipped a lung or not. After a long wait in my tree stand, I got down and found my arrow. It had some meat, a little blood and some hair on it. There was no blood for about 100 yards and then I found some. He was dripping out of both sides and was circling back to where he had come from initially. I pulled out after about an hour and decided I would give him a few hours. Later that day my son and I picked back up on the blood trail and eventually ran out of daylight. The next morning I went out and found his bed and he wasn’t in it! At that point, I was thinking I must have hit that void between spine and lung. This has happened to me before and I’m sure it’s happened to many of you archers out there. Until last night, my mind was all over the place as to his whereabouts. 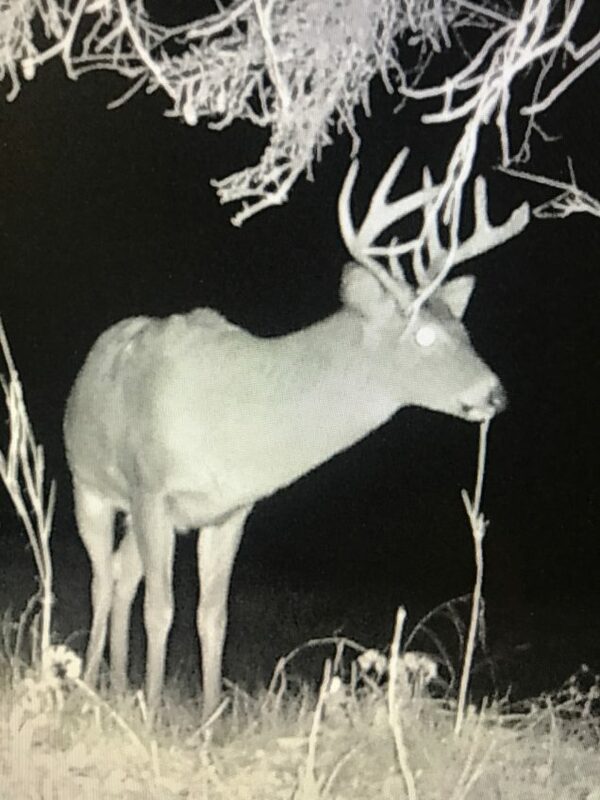 I got a picture of him on my trail camera and he is a tough bugger, just like all of the other whitetail deer that roam these woods. Hitting the RIGHT SPOT is very, very important and thats why it’s so important to keep focused! I’m thankful I might possibly get another crack at him before the end of the season, and maybe tonight is the night!